Double aquarium stands have been on the market for some time, but just because they are available, does that mean they are a wise choice for an aquarium owner? The answer depends largely on factors within the owner’s home. In some cases, it’s a great way to have two tanks occupy the same space that one normally would, while in other cases it’s a disaster waiting to happen. I always like to start with the positive, and there are certainly pros to having a double aquarium stand. At the top of the list is the space savings. With a double stand, you can keep two aquariums in the same floor space as a single tank would take. 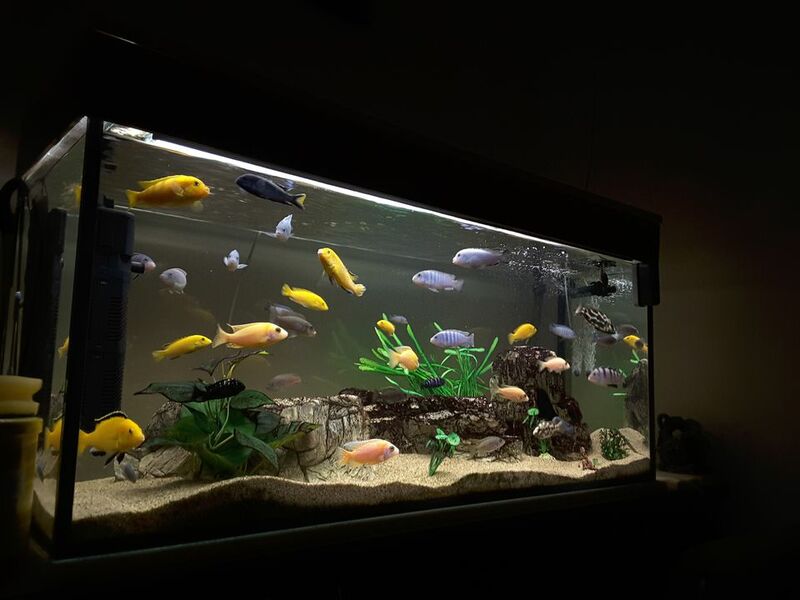 If you are like many fish lovers, there is never enough room for all the fish you want to keep. Having a second tank doubles the fish keeping options. Even if you aren’t in need of more room for fish, there is still a good reason to have a second tank. Everyone should have a quarantine tank, but few people set aside space for it. When bringing new fish home, they should be separated for a period of time to verify they are healthy before adding them to the main tank. Likewise, when fish become ill, it’s usually best to treat them in a separate tank. Having a quarantine tank ready to use is a perfect way to treat sick fish while not disturbing the main tank. Breeding fish is fun but can be challenging in a community aquarium. Best results are obtained when having a separate breeding and rearing tank. The optimal breeding conditions can be created in the breeding tank, and once the breeders have spawned, they can be moved back to the main tank. The fry can then be reared in the breeding tank, with no danger of being eaten by the adult fish. It’s a win-win situation all around. Last but not least, if not using the second tank for fish, it can be used to age water. Set the tank up with a filter and heater, fill it with water, treat it and let it run. When it comes time to perform a water change on the main tank, use water from the second tank. It will make water change time less stressful for both you and your fish. After changing the water in the main tank, simply fill the secondary tank and you will be ready for the next water change. Meanwhile, you have a tank up and running at all times for quarantine purposes. Of course, there is a downside to using a double tank stand. One of the biggest negatives is the fact that the second tank is rather cramped at the top, making maintenance challenging. Large items, as well as larger fish, cannot be easily moved in and out of the lower tank. Viewing the lower tank is not as enjoyable as the upper tank because one must either bend over or sit on the floor. However, the lower tank is at the perfect height for viewing by small children, which brings up another potential negative. Children and pets can easily access the lower tank, which has the potential for a variety of problems. It’s hard enough to keep small hands or curious pets paws, out of an aquarium when it is at a higher level. Move the tank down to nearly floor level, and problems are sure to follow. Another problem with a double tank stand that few people think of is the weight issue. The floor may be strong enough to hold the weight of one filled tank, but two filled tanks in the same space could be too much in some locations. This is particularly true with larger tank sizes. Ten gallon tanks are not likely to be a problem anywhere, but two seventy-five gallon tanks are a different matter. Combined, they come to a whopping 1700 pounds when both are filled, all of that weight resting on a mere 48" by 18" space. Always estimate the total weight and verify your floor can handle it. Lastly, the lower tank is more likely to be exposed to drafts and cooler air temperatures than the upper tank. This can be offset with a heater but should be kept in mind when using a double tank stand. If you are keeping fish in both tanks, you may want to consider keeping coldwater fish in the lower tank. Then you need not worry about them getting too chilly, especially if you live in northern climates where temperatures get low in the winter months.